First, some general comments reflecting on my first posting and ultimately the many others to follow. In my About Diagrams I sketched out what I see are a few key features of conventional diagrams, especially those that I feel are more readily transferable to art. And in the Diagrams and Art paper, I trace how these diagrammatic qualities migrated to the art practices of several historically important artists and movements of the first decades of the 20th century. However, a far more nimble and less scholarly approach is required to articulate the many ways contemporary artists mirror diagrammatic thinking in their practices. Here we are no longer talking about conventional diagrams whose practical utility is readily apparent along with the more straight forward correspondences between their graphical displays and their references. Rather we are now squarely in the domain of art which is famously difficult to explain, much less to corral into precisely circumscribed categories. So absent any obvious need for practical utility, we need to ask what motivates these artists to deploy diagrammatic processes, and how does diagrammatic thinking manifest in their artworks? The answers to these questions will vary with each artist, but already I’m beginning to discern a few general subcategories of how and why different artists engage in diagrammatic thinking. No question, these are a bit spongy and certainly not mutually exclusive, but here are a few that come to mind thus far. Some artists turn to diagrammatical languages to conceptualize or to visualize spiritual aspirations in their work. Others are drawn to various kinds of mapping of real or imagined spaces. 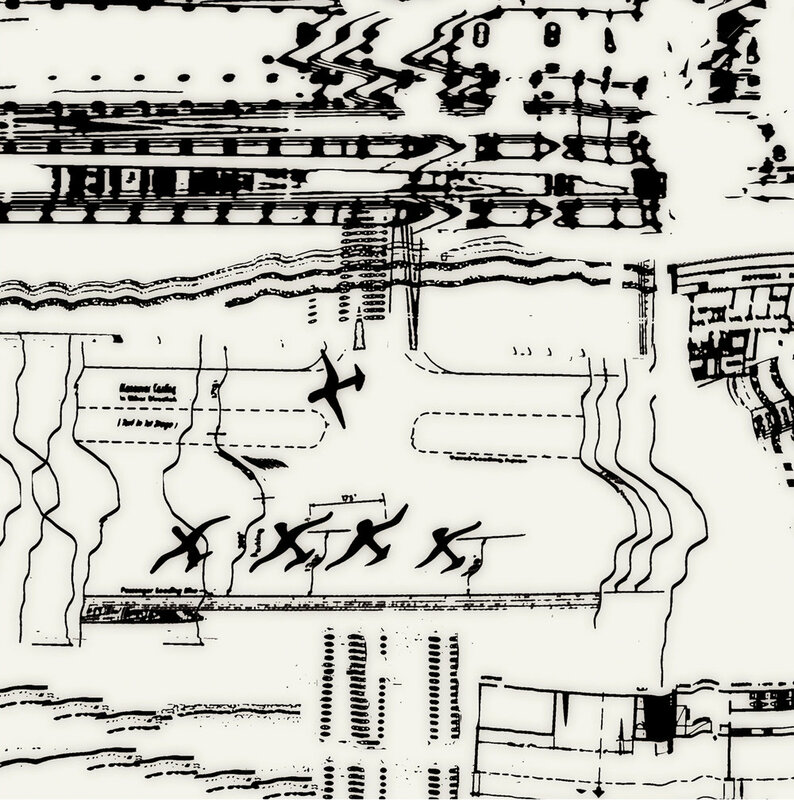 Similar to mapping, many artists deploy architecturally inspired schematics for their meditations on spatial experience. Many artists employ diagrammatic languages in response to the pervasive information and networked technologies of our time. Some turn to diagrammatic thinking as a way to visualize more abstract/philosophical ideas while others employ diagrammatic motifs and processes to support more poetic or expressive sensibilities. Again, these subcategories of diagrammatic-based art practices are not mutually exclusive and often operate in tandem with each other. Still, I want to highlight yet one more overriding motive, one that to varying extents permeates all the others I’ve just listed—namely, play. It’s hard for me to conceive of many artists out there who are not fueled by the transformational power of play—to play with tools, with materials, with color, with concepts, with meaning, and so on. And so it should be no surprise that there are artists who play with diagrams and diagrammatic thinking. And this leads me to my first featured artist, ROSAIRE APPEL. Long before I ever thought a lot about diagrams and art, I’ve greatly admired the work of New York artist, Rosaire Appel. In the years that I have been observing her work—mostly through social media—I have followed her explorations in a wide range of media, including video, collage, drawing, photography and especially her extraordinary artist books. I remember when I first met Rosaire in person at an art opening in New York; I believe I told her straight away that she was the most inventive artist alive (or something like that). To this day, I continue to be impressed by the quantity, scope and originality of her output. But even more, I am amazed by her overriding sense of playfulness. There seems to be nothing in her visual and sonic surround that has not or won’t soon be grist for some unexpected combination of words, notations, images, maps, marks, charts, musical scores and any number of diverse materials. Aside from a few notable exceptions, most accomplished artists have reigned in their output to a fairly narrow bandwidth of possibilities beyond which they rarely tread for fear of utter incoherence (or perhaps, a disapproving dealer). This peculiar kind of conservatism facilitates for their viewers a ready through-line by which they can assign that artist a distinct identity—an artistic “self” as it were—that remains relatively stable and persistent over time and through the countless iterations of their creations. For example, we might say of artist #1 that she’s that abstract artist who does the rectangles in primary colors, whereas we can always spot Artist #2’s paintings because of his signature cartoonish dogs wearing fedoras. Overly simplistic, but I hope you get the point. So I have to ask myself what could possibly be the “through line”—that stable art “self”—that inheres in Appel’s prodigious output? What is that core something in her work that I have little trouble spotting despite its exceptionally wide variety of incarnations? To be honest, I’m not really sure, and that’s probably why her work continues to fascinate me—a little mystery is a wonderful thing. Yet there is something that persists in her work that I pick up on. I’m not claiming that this something fully defines her work, but yet there is some particular feature in what she does that keeps insisting. And to my eye, it has something to do with diagrammatic thinking. Rosaire and I had a few brief exchanges leading up to this post, although nothing like a formal interview. I know that she would attest to the presence of diagrammatic thinking in her work, but perhaps not to the same extent or so analytically as I do. But short of producing a major catalog-like essay of her work, I will make a couple quick stabs at drawing meaningful connections from what I’ve written elsewhere [see https://www.stevenbaris.com/about-diagrams/] to key diagrammatic features I see operating in many of her works. So let me begin with the least likely candidates for displaying diagrammatic thinking: her photographs. And what is more pictorial, more non-diagrammatical than photographs? And as I’ve discussed elsewhere, pictures typically prompt the viewer to imagine a scene, a person or object, and this is not what diagrams do. Although the two photographs posted here are not typical of her photographic output, it’s worth pointing out the extent to which these eschew any kind of “picturing” of something in favor of displaying something akin to diagrammatical “instructions” or, in the one below, a classic diagrammatical spatial/graphic display of a temporal process of surface decay and successive repairs. Both of these mirror a key diagrammatic feature which is it’s tendency to “explain” as much or more than to “represent.” My immediate response to these photographs is not so much to imagine a scene, but rather to actively correlate these unexpected juxtapositions of visual elements—to figure them out. By no means does my reading of these photos diminish their artistic/expressive impact; rather I happen to think that it may enhance it. Leaving her photographs, let’s turn to a more properly diagram-like work posted below. Summer Plans presents a virtual diagrammatic wedding cake, with one layer laid over another; the bottom layer, a found “conventional” diagram (architectural plans) graphically subdivided as a grid of cells upon which she applied an varied array of suggestive marks. I suppose these marks could be easily “read” as nothing more than decorative flourishes, but I can’t help but to see them as explaining or instructing me of something, which, in turn, prompts me to actively play with them (correlate, cross-reference) to make sense of it all. I find myself responding similarly to virtually all of her pieces, knowing full well that from the her perspective there may be no sense to be made whatsoever. Again, we’re looking at art here, not conventional diagrams. But my point is that Rosaire’s process of making these and many other works is not only influenced by diagrammatical thinking but very much a result of playing with diagrammatical thinking. I look at her artworks, and I see an artist taking delight in the expanded diagram’s propensity to transform marks into meaning and meaning into marks. As well, she posts frequently on Instagram @rappelx and Facebook. This blog is a component of the Expanded Diagram Project where I am exploring the intersections of diagrammatic thinking and a broad range of historical and contemporary artistic practices. Some of the posts will focus on contemporary artists while others will feature what I am calling vignettes, relatively short passages touching on different manifestations of diagrammatic thinking in art and culture. I envision this blog as a venue for ongoing conversations, and I welcome your thoughts and comments. To learn more about the Project, check out the links below.